Do you have your undergraduate degree in a business related field of study? Is your entry level position not fulfilling your career goals anymore? Are you ready to pursue a higher level of education so that upper level executive positions will be available to you? If you answered yes to each of these questions then perhaps you should consider obtaining your Master's Degree in in human resources. Keep in mind, thanks to the educational availabilities that the internet makes possible, you can likely complete this degree program while maintaining your prior responsibilities. Many colleges or universities offer degree programs that are strictly in an online learning format, while others offer programs that are campus based. Still other programs offer a hybrid type degree program that will provide students some campus based classes and some distance learning courses. Ultimately, you should choose a school that offers a program that suits your lifestyle, your schedule, and you're learning style. Generally speaking, the course work that is required by an MBA in human resources is designed to teach you about personnel recruitment, time management, and cultural diversity issues. You should expect this degree program to take approximately two years to complete, which will involve between thirty and forty semester hours. It is important to understand that many colleges will require applicants to this degree program to have completed the GMAT (Graduate Management Admission Test) and have at least a few years of relevant experience. As you begin working on your degree program you will be required to take a class in personnel management. In this course you will learn about a variety of theories related to organizational structures and human behavior, as well as diversity issues within the work place, legal factors, and ethical issues as they relate to a work place. Ideally, upon completion of this course work you will have an understanding of human behavior and how it factors into creating a sound and successful business environment. You will also be required to successfully complete a management finance course. Most programs will be designed to help you learn how to evaluate an existing business's budget and to create a budget for a business. You will also learn to study the principles of a business's cash flow and appropriate statistical analysis tools. Each of these factors are intended to provide you with the information you will need to make successful financial decisions for a business and to teach you how to use your financial problem solving skills. 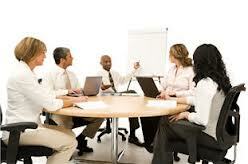 Within your master's degree in human resources course work you will also be required to complete a marketing class. This class is intended to teach you how to plan and organize a successful marketing campaign. You will also learn how to budget a promotion, how to execute a created promotion, and how to analyze a promotion to determine its cost effectiveness. This will help you learn to create campaigns that are effective, efficient, and profitable for the business you work for. It is important to note that the prospects you will have by obtaining your graduate degree in human resources are quite promising. This career area is projected to grow at a rapid pace over the next few years, so there is definitely no better time to secure your MBA in this profession. It is also important to understand that an area of specialization within human resources will allow you to stand out against your fellow job seekers even more. You will also want to consider continuing your education to keep you abreast of current human resource trends, technological trends, and changing methods related to business.